As waters rose to levels that threatened to swallow vast swaths of southern Alberta this summer, it was the question that wasn't too far back in the minds of Albertans who were then living through the second major flood in eight years. How does the flood that ravaged parts of Canmore, Calgary, Medicine Hat and that virtually swallowed up High River whole, compare to that other historic and very costly deluge, the one that besieged Winnipeg in 1997? Was what Albertans were experiencing in late June even as bad as the one that wreaked havoc on Alberta in 2005? 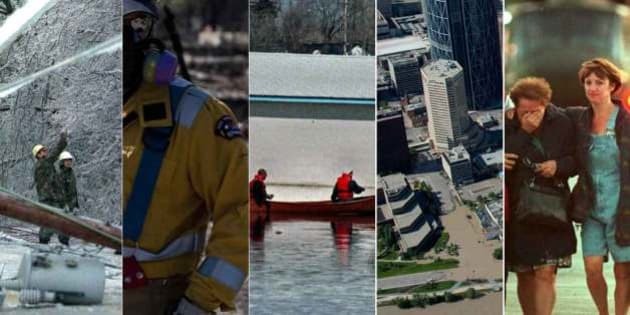 Now, an interactive graphic compiled by Alberta Construction Magazine compares the cost of the 2013 Alberta flood to other massive natural disasters, such as the Quebec/Ontario ice storms and the Red River flood of 1997. When people rushed out of their Manitoba homes, and the Army rushed into the Red River basin, the flood that inundated Winnipeg was then considered the costliest natural disaster in Canadian history. Click through the slideshow below for a breakdown of how the cost and damage of the Alberta flood compares to that event and Canada's other historic disasters. But where the work done by Alberta Construction Magazine really shines is when it compares this summer's flood to that other one-in-100-year flood less than 10 years ago - the 2005 Alberta flood. The graphic compares the two events in a head-to-head comparison pitting costs, human toll, infrastructure damage, magnitude and sheer volume of water that Mother Nature unleashed on the same communities, eight years apart. CLICK TO SEE THE COMPLETE GRAPHIC HERE.